Raah – a ‘Literary and Cultural Center’ was opened on Dec 3, 2017 by sibling-duo Aiman Mehta and Azhar Tambuwala, under the umbrella of the Raahat Foundation. The intent behind it was to act as a platform to encourage and showcase talent; a creative and performing arts space, where people could come to enrich and exercise their mental faculties. Raah is open to people of all ages, from all backgrounds – and usually hosts events around writing, public speaking, travel, poetry, theatrical/musical performances, etc. Housed in a space that has its own small stage, green room, and performance area – they can fit around 80 – 90 people here at a time. Raah even has their own library – with a generous number of books having been donated by noted columnist Jug Suraiya – and its monthly membership is just INR 150 (with an INR 200 refundable deposit). If you feel peckish, there’s also a little cafe on-site which serves snacks and coffee at very pocket-friendly prices. Musicians are welcome to come and jam with their own instruments and sound systems, as well. Raah is a non-profit organisation, and so entry to their workshops, talks, and performances is on a donation-pass basis which varies according to the event in question. Their monthly schedule is shared on their Facebook page with all the corresponding information. 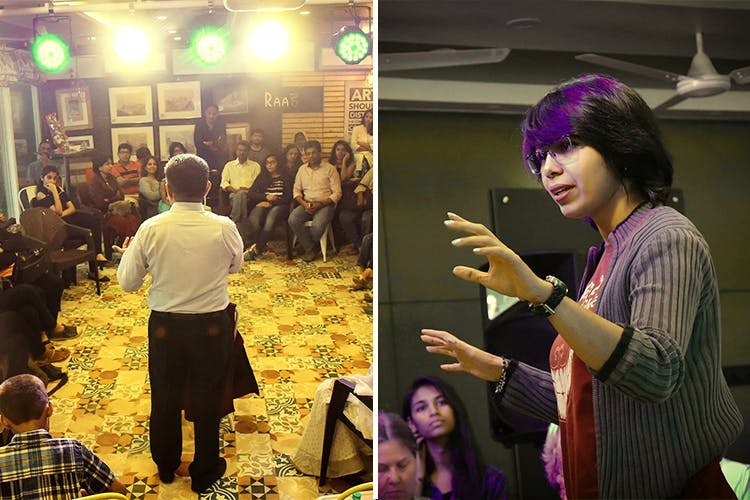 Upcoming events include the Toastmasters Club of Pune South convening every Saturday, as well as storytelling with ‘Tales & Twists’, a beginner workshop on photography, a ‘travel talk’, a performance of Tagore’s music, open mic poetry with Airplane Poetry, and a couple of theatrical productions – The Merchant of Venice (by The Drama Queens), and ‘Past Nine Weeks In The Life of Kartik’. Raah is also hosting an ongoing donation drive for toys, clothing, books, etc. which will be charitably redistributed by the Raahat Foundation.